as usual Walking around Caracas late last month during Venezuela's ongoing protests, I was surprised by what I saw. My expectations had been shaped by persistent U.S. media coverage of the nationwide strike called by the opposition, which seeks President Hugo Chavez's ouster. Yet in most of the city, where poor and working-class people live, there were few signs of the strike. Streets were crowded with holiday shoppers, metro trains and buses were running normally, and shops were open for business. Only in the eastern, wealthier neighborhoods of the capital were businesses mostly closed. strike This is clearly an oil strike, not a "general strike," as it is often described. At the state-owned oil company, PDVSA, which controls the industry, management is leading the strike because it is at odds with the Chavez government. And while Venezuela depends on oil for 80 percent of its export earnings and half its national budget, the industry's workers represent a tiny fraction of the labor force. Outside the oil industry, it is hard to find workers who are actually on strike. Some have been locked out from their jobs, as business owners -- including big foreign corporations such as McDonald's and FedEx -- have closed their doors in support of the opposition. no dictatorship Most Americans seem to believe that the Chavez government is a dictatorship, and one of the most repressive governments in Latin America. But these impressions are false. arrests Not only was Chavez democratically elected, his government is probably one of the least repressive in Latin America. This, too, is easy to see in Caracas. While army troops are deployed to protect Miraflores (the presidential compound), there is little military or police presence in most of the capital, which is particularly striking in such a tense and volatile political situation. No one seems the least bit afraid of the national government, and despite the seriousness of this latest effort to topple it, no one has been arrested for political activities. power Chavez has been reluctant to use state power to break the strike, despite the enormous damage to the economy. In the United States, a strike of this sort -- one that caused massive damage to the economy, or one where public or private workers were making political demands -- would be declared illegal. Its participants could be fired, and its leaders -- if they persisted in the strike -- imprisoned under a court injunction. In Venezuela, the issue has yet to be decided. The supreme court last month ordered PDVSA employees back to work until it rules on the strike's legality. absurd To anyone who has been in Venezuela lately, opposition charges that Chavez is "turning the country into a Castro-communist dictatorship" -- repeated so often that millions of Americans apparently now believe them -- are absurd on their face. coup If any leaders have a penchant for dictatorship in Venezuela, it is the opposition's. On April 12 they carried out a military coup against the elected government. They installed the head of the business federation as president and dissolved the legislature and the supreme court, until mass protests and military officers reversed the coup two days later. court Military officers stand in Altamira Plaza and openly call for another coup. It is hard to think of another country where this could happen. The government's efforts to prosecute leaders of the coup were canceled when the court dismissed the charges in August. 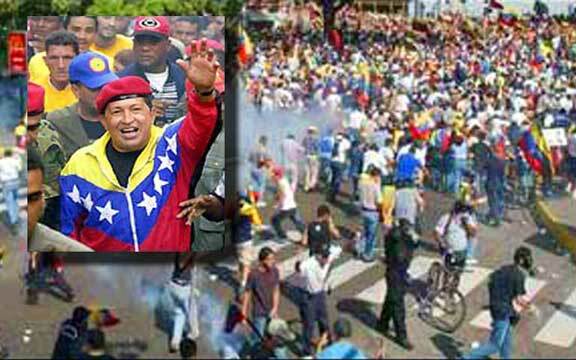 Despite the anger of his supporters, some of whom lost friends and relatives last year during the two days of the coup government, Chavez respected the decision of the court. deception The opposition controls the private media, and to watch TV in Caracas is truly an Orwellian experience. The five private TV stations (there is one state-owned channel) that reach most Venezuelans play continuous anti-Chavez propaganda. But it is worse than that: They are also shamelessly dishonest. For example, on Dec. 6 an apparently deranged gunman fired on a crowd of opposition demonstrators, killing three and injuring dozens. Although there was no evidence linking the government to the crime, the television news creators -- armed with footage of bloody bodies and grieving relatives -- went to work immediately to convince the public that Chavez was responsible. Soon after the shooting, they were broadcasting grainy video clips allegedly showing the assailant attending a pro-Chavez rally. democracy Now consider how people in Caracas's barrios see the opposition, a view rarely heard in the United States: Led by representatives of the corrupt old order, the opposition is trying to overthrow a government that has won three elections and two referendums since 1998. Its coup failed partly because hundreds of thousands of people risked their lives by taking to the streets to defend democracy. So now it is crippling the economy with an oil strike. The upper classes are simply attempting to gain through economic sabotage what they could not and -- given the intense rivalry and hatred among opposition groups and leaders -- still cannot win at the ballot box. revenue From the other side of the class divide, the conflict is also seen as a struggle over who will control and benefit from the nation's oil riches. Over the last quarter-century PDVSA has swelled to a $50 billion a year enterprise, while the income of the average Venezuelan has declined and poverty has increased more than anywhere in Latin America. Billions of dollars of the oil company's revenue could instead be used to finance health care and education for millions of Venezuelans. democracy Now add Washington to the mix: The United States, alone in the Americas, supported the coup, and before then it increased its financial support of the opposition. Washington shares PDVSA executives' goals of increasing oil production, busting OPEC quotas and even selling off the company to private foreign investors. So it is not surprising that the whole conflict is seen in much of Latin America as just another case of Washington trying to overthrow an independent, democratically elected government. government This view from the barrios seems plausible. The polarization of Venezuelan society along class and racial lines is apparent in the demonstrations themselves. The pro-government marches are filled with poor and working-class people who are noticeably darker -- descendants of the country's indigenous people and African slaves -- than the more expensively dressed upper classes of the opposition. Supporters of the opposition that I spoke with dismissed these differences, insisting that Chavez's followers were simply "ignorant," and were being manipulated by a "demagogue." fascism But for many, Chavez is the best, and possibly last, hope not only for social and economic betterment, but for democracy itself. At the pro-government demonstrations, people carry pocket-size copies of the country's 1999 constitution, and vendors hawk them to the crowds. Leaders of the various non-governmental organizations that I met with, who helped draft the constitution, have different reasons for revering it: women's groups, for example, because of its anti-discrimination articles; and indigenous leaders because it is the first to recognize their people's rights. But all see themselves as defending constitutional democracy and civil liberties against what they describe as "the threat of fascism" from the opposition. violence This threat is very real. Opposition leaders have made no apologies for the April coup, nor for the arrest and killing of scores of civilians during the two days of illegal government. They continue to stand up on television and appeal for another coup -- which, given the depth of Chavez's support, would have to be bloody in order to hold power. backs coup Where does the U.S. government now stand on the question of democracy in Venezuela? The Bush administration joined the opposition in taking advantage of the Dec. 6 shootings to call for early elections, which would violate the Venezuelan constitution. The administration reversed itself the next week, but despite paying lip service to the negotiations mediated by the Organisation of American States, it has done nothing to encourage its allies in the opposition to seek a constitutional or even a peaceful solution. change Sixteen members of Congress sent a letter to Bush last month, asking him to state clearly that the United States would not have normal diplomatic relations with a coup-installed government in Venezuela. But despite its apprehension about disruption of Venezuelan oil supplies on the eve of a probable war against Iraq, the Bush administration is not yet ready to give up any of its options for "regime change" in Caracas. And -- not surprisingly -- neither is the Venezuelan opposition.